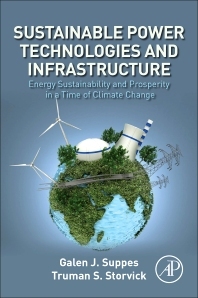 This book presents an overview of current renewable energy sources, challenges and future trends. Drawing from their longtime expertise and deep knowledge of the field, the authors present a critic and well-structured perspective on sustainable power sources and technologies, including solar, wind, hydrogen and nuclear, both in large and small scale. Using accessible language they provide rigorous technological reviews and analyze the main issues of practical usage. The book addresses current questions in this area, such as: "Is there enough biomass to make a difference in energy needs? Should biomass be used in Energy Generation? "; "How mature is battery technology? Will it finally become cost effective, and will it make a significant difference this next decade? "; "How big a role will small and modular nuclear power generation play in the coming decades? "; "What will be the influence of national tax policies?". No prior technical knowledge is assumed of the reader. It is, therefore, ideal for professionals and students in all areas of energy and power systems, as well as those involved in energy planning, management and policy. Presents a realistic and clear overview of the key sustainable energy technologies that will play important roles in the world’s energy mix and their impact on the current power infrastructure. Discusses key societal and economic topics related to the implementation of sustainable energy sources in a straightforward way. Covers a broad variety of sustainable and renewable energy sources, including hydrogen and bioenergy. It also explores key issues on small modular nuclear facilities, advances in battery technologies, grid integration, off-grid communities and the most recent topics in energy economics and policy. Galen J. Suppes is a professor at the Department of Chemical Engineering of the University of Missouri, Columbia, USA. He received his B.S in Chemical Engineering from Kansas State University in 1985, and his Ph.D. from The Johns Hopkins University in 1989. He has also done Post-Doc Class Work at the University of Huston in 1991/92, and is author of over 120 documents, including peer reviewed articles, conference papers and scientific reports. Truman Storvick is Professor Emeritus of the University of Missouri, Columbia, USA. He has received his bachelor’s degree in chemical engineering from Iowa State University and his doctorate in chemical engineering from Purdue University, and has co-authored more than 50 publications and books. He is still active in education through MU Extension Division/OHSER courses, and is researching nuclear power, conversion of fuels to electricity, fossil fuels and climate change.